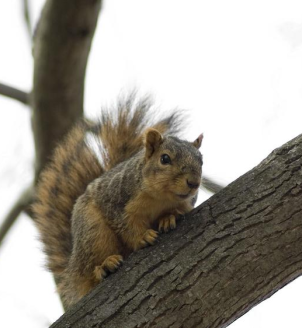 It is a common belief that squirrels routinely forget where they bury nuts, but squirrels are also bandits that steal whatever they can find from you or a neighbor. One day this autumn, I watched one neighboring squirrel raid the nest of the homesteading squirrel who has taken up residence in our front yard tree. A few days later, the homesteader buried another cache of nuts on our boulevard. As soon as he left, the neighbor came over, searched, pillaged and re-buried our homesteader's bounty. No wonder the homesteader can't find his stockpile! This episode of squirrel thievery brought to mind my first encounter with the larceny of squirrels. I think the squirrel's larcenous instincts are inborn. You can baffle a squirrel to keep it out of your bird feeder, but you can't baffle your boulevard or your berry patch. After years of successful vegetable and flower gardening, I decided to try my green thumb at a strawberry patch. I did everything wrong from planting to pruning and, of course, because it was the first year I didn’t get a harvest anyway. Totally frustrated, and not knowing that strawberries were biennial, I just let the patch go, but the next spring I got a crop! One berry. I watched that berry grow from a blossom to a berry bud. It grew and became a magnificent specimen. When it grew to about the size of a golf ball, it began to ripen. I really watched it close, waiting for the time when I would finally get a harvest—although a small one—from my first strawberry patch. Finally, one evening I decided to let the berry ripen one more night and pick it in the morning. The next morning I strode triumphantly to my berry patch, mouth watering in anticipation. I swear he was even smacking his lips! I was infuriated, but what could I do? I went to the local garden shop and got a book on how to grow strawberries so that in subsequent years, both the squirrel and I could quench our strawberry craving.